I find rearing leaf miners to be one of the most rewarding forms of mothing. From finding the mines, observing them and their inhabitants under a microscope, the challenge of rearing them through to adulthood (which can take several months) and finally the equally challenging task of photographing the tiny adults. WHY BOTHER SEARCHING FOR AND REARING LEAF MINERS? 1. 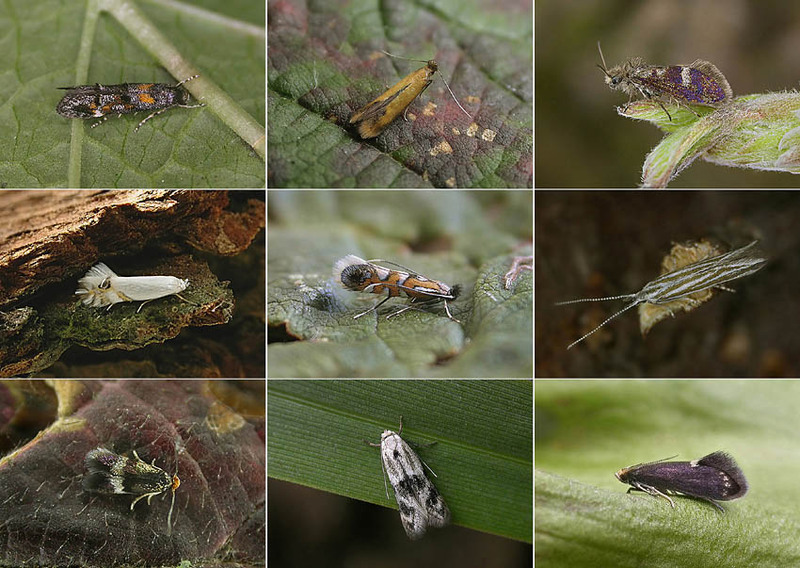 You will record many additional species to your area as a lot are are not attracted to light or only weakly so. 2. Identifying the species at the mining stage is often straight forward or at least it provides vital information for identifying the adult later on. Identifying the adult alone is often a job for experts - usually involving dissecting the moth. 3. Having successfully reared a moth it is usually an almost perfect, unworn specimen which makes for a good photo opportunity. 4. Moths in traps, especially singletons don't tell us where they have bred. They may have travelled many miles. Finding mines gives a positive breeding record for a site. 5. Rearing miners gives an interesting insight in to their early stages such as which foodplants they use, what types of mines they create, where they pupate etc. 6. It keeps the mothing "season" going all year round often at times when moth traps can have disappointingly low catches. Eriocrania, easy mines to find and rear but takes 9 or 10 months to do so and identifying the larvae isn't always straight forward. Stigmellas, easy mines to find but rearing can be a bit hit and miss. Adults hyperactive and difficult to photograph. Phyllonorycters, mines easy to find and can be very easy to rear. Adults can be difficult to photograph unless caught just after emergence. Coleophoridae, cases often hard to find but generally easy to rear and photograph. 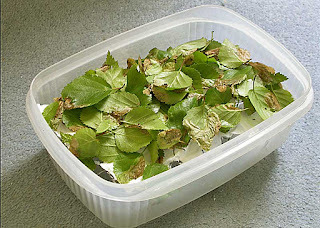 The UK leaf miners site has several articles on rearing leaf miners amongst their newsletters. January and February 2007 being particularly useful. Useful literature on the subject is "Breeding Butterflies and Moths - a practical handbook for all European species" by Ekkehard Friedrich. It gives information on rearing all lepidoptera including micros and leaf miners. Obviously such sites as UK Leaf miners, Dutch Leaf miners and UK Leaf miners Yahoo chat group are invaluable - especially for identifying the mines in the first place (important!). The links to which are on my home page. If you don't need to rear large numbers of many different species and just want a taste of what it's all about then following some basic steps should suffice. These are my methods with which I have had quite a few triumphs and the occasional failure but for most groups they work well. A good beginner's group. 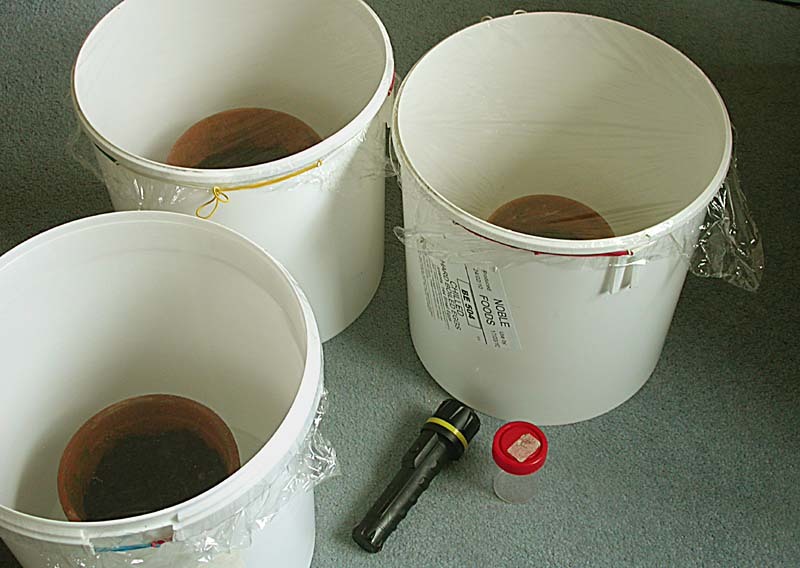 Summer generation mines can be placed in a rearing jar with nylon secured to the top and damp tissue around the stem in case the larvae are still feeding. Make sure the mines are intact with no tears, exit holes or empty pupal cases showing. Adults may emerge in a matter of hours or days. A big advantage with this group is that the larvae pupate inside the mine and so need no extra provisions. Autumn mines need to be overwintered. Place the mines in a nylon pocket and tie to a numbered, wooden frame for identification later on. Leave outside under bush to provide a little shelter from the elements and out of the sun. Snow, rain and hard frosts have no harmful effects on the pupae and are beneficial to their development. Around the end of February the mines are brought indoors and kept in rearing jars with nylon secured around the top to let the moisture escape but not the moths. I spray the leaves (what is left of them) every couple of days or so but this may not be necessary, force of habit I suspect. Keep the wall of the pot dry. Emergence should be in approximately three weeks but this can vary a lot. Nowadays. since purchasing a microscope I find it easier to dissect the mines to see if there are any live pupae present and if so, remove them and place them on tissue paper in a jam jar lid and screw the jar on to the lid. This aids observation of the developing pupae and the emergence of the moths. A small piece of damp tissue squeezed almost dry is added for a little humidity. Any condensation formed on the jar wall should be allowed to evapourate. The mines are easy to find, Silver Birch is best as it host several species. Collect mines that are quite well advanced and obviously have larvae present. Holding them up to the light will soon tell you. I lay them out on a piece of tissue paper layed on mesh (chicken wire) inside a plastic tub. Spraying a couple of times a day keeps the leaves healthy for the larvae to continue to feed. This arrangement allows the mature larvae easy access to the tub bottom after vacating the mine (see below). There they can be collected, identified (important) and placed in to a plant pot two thirds full of potting compost where they should quickly burrow down. Bury the pots outdoors so the compost is level with the soil. Secure nylon around the top and label the different pots if you have more than one species. Site them in a semi-sheltered location out of the sun. Next Feb/Mar. bring the pots indoors and in my experience the adults start to emerge within 5 to 10 days. Give the compost a light misting every day or two to prevent a crust forming. I store the pots in large white buckets with cling film over the top to allow moisture to escape. This gives excellent visibility to see any newly emerged adults. When they do emerge they are usually quite docile, sitting on the rim of the pot and allowing good photo opportunities. These can be treated like any other larva, just change the food every day or so and keep the rearing pots airy to prevent any mould from forming. They like to wander a fair bit and sometimes they'll stop moving all together for a few days which may mean they've pupated. But then they may start to wander again, so keep the fresh food ready. I've always kept it simple by collecting the larvae in spring which negates having to overwinter them. I've not had the greatest success with this group having only reared a handful of species but here are my methods for the record. One species I did do well with is one of Yorkshire's smallest moths, Stigmella microtheriella which mines Hazel. I put a dozen mines in a few rearing jars, some with potting compost in and some with a couple of sheets of kitchen roll in the bottom. Wrap damp tissue around the stems to keep the leaves fresh until the larvae have fed up - the jar lids are left off for now. 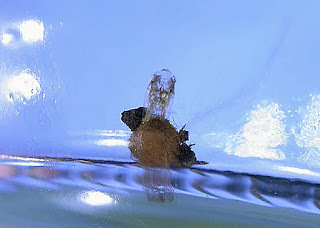 After the larvae have vacated the mines and spun their tiny cocoons remove everything else from the jars and add a small piece of damp tissue squeezed almost dry and replace the lid. This adds a little moisture to the air to prevent dessication but not too much that the pupae will go mouldy. Check daily for any condensation on the wall of the jar, this must be allowed to evaporate by removing the lid. If the tissue dries out it should be re-wetted and squeezed almost dry again. After a couple of weeks or so I had eight adults emerge. Below a photo of my first stigmella rearing success! Not many moth-ers can count an empty pupal case and cocoon amongst one of their all time favourite pics! As for autumn stigmella mines the least said about my efforts the better - just two species reared. I simply placed the mines in a half litre plastic pot with a couple of inches of potting compost in the bottom until the mines were vacated. 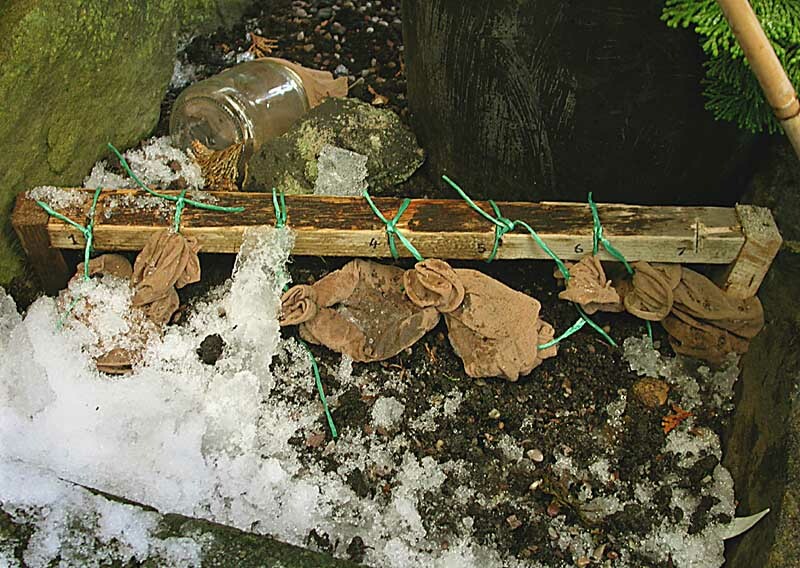 I then removed the leaves and secured nylon over the top and left them out over winter in a shaded and partially sheltered site in the garden. I then brought them in next Feb/early March and hoped for the best. I think forcing them in to emerging too early was my downfall, better to wait until emergence in the wild is almost due. If you do go down the leaf miner rearing route you will have failures, you will be disappointed when out pops a parasitic wasp instead of a prized specimen. But trust me, you will have successes - plenty of them. And you will have delved in to a most fascinating, hidden world where the most beautiful and exciting creatures live. They are everywhere from the bleakest moors to your own back garden. Give it a go and tell me how right I am. One species from each of the nine families I've had successes with. That's a really excellent account of rearing leaf miners. Sorry I haven't got round to reading it before. Good to know you found it interesting Steve. Leaf mining is a fascinating subject in its own right and is a great way to keep the mothing "season" going all year round.